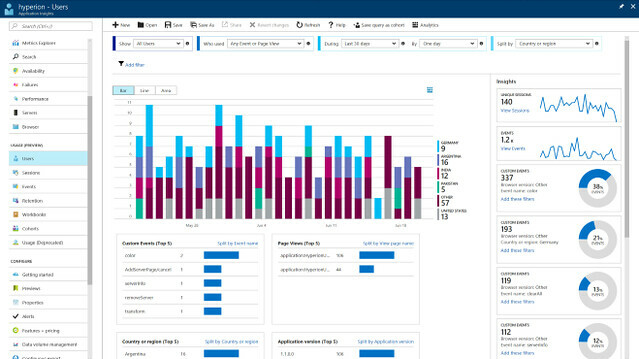 Recently, I’ve been working on Usage features for Application Insights in the Azure Portal. Our new usage features are still in preview mode, and include Users, Sessions, Events and Retention tools. A person would normally use them to look at how users use their websites or app, what they click on, how often they come back, etc. The retention tool lets you see how many people come back to your app after a certain amount of time. The newest feature I’ve been working on is called Workbooks, and kind of allows you to merge all of those other tools into a single live “report”. When you create a new workbook, it has a markdown text area as the first section, and a default users section next, just so there’s something there. You can add/move/remove/clone and put more markdown wherever you want. The users/sessions/events/retention charts get you some built in things pretty easily, and for pretty much everything else, you can harness the full power of analytics queries. It starts with users/events tools split by country or what event was most common, then looks at overall retention (in this case,☹), and retention of people who actually use something in the app (🙂 but ☹ since there’s only 4 of those users), then a chart of users by device type, then since there’s a long tail, an analytics query that gets the full list of those devices and their counts as a table, then fun with an analytics query that predicts the future by using evaluate forecast. Anyone else who could log into Azure and normally see any of this data can now see this beautiful report I’ve made, and it will show them live data, and they can clone it and modify it however they want. There’s more to be done in workbooks. we’re still trying to figure out what other Application Insights things to show inside a workbook, and now to clean up editing so you don’t need 100 gray edit buttons down the side, etc. I’ve been investigating Azure Notebooks (and Jupyter Notebooks) as well, and some way of exporting from here to there, so that you can turn a workbook like above into python code and /or do even more stuff there. 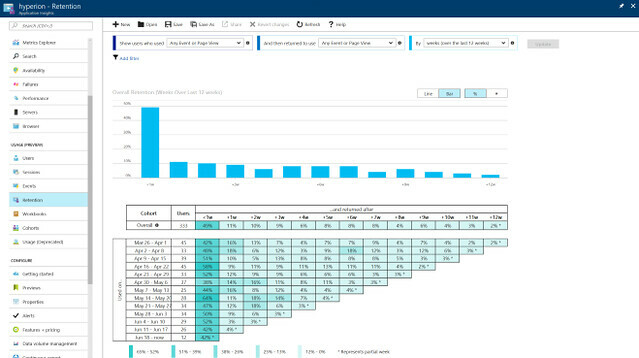 If you use Application Insights, try out workbooks (and all the other usage features, there are even more coming all the time, so you might find things that aren’t talked about here! ), and if you have any feedback, drop me a line, either sending me email directly or by using the feedback tool in the Azure portal! For a while, I’d been looking at options for a “small” lift for my jeep. 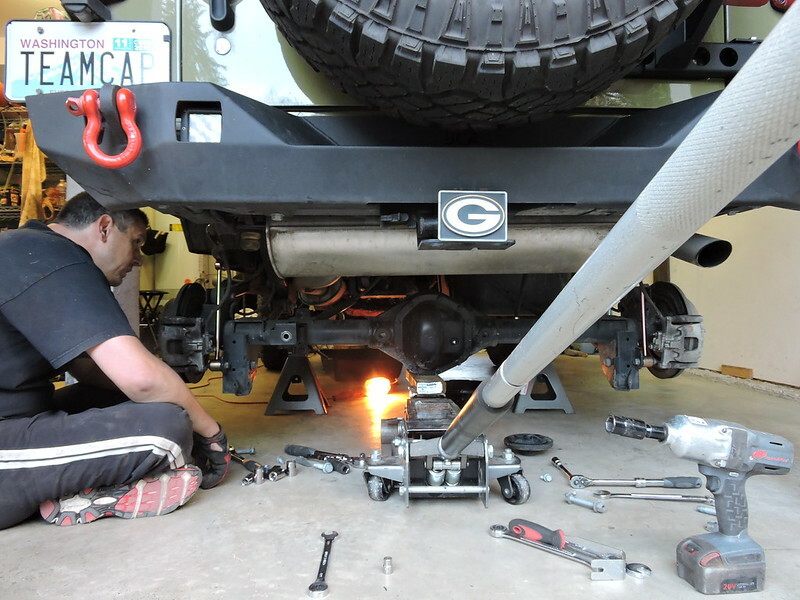 Nowadays, there are an infinite amount of options, from leveling kits, to suspension lifts, to body lifts, offered by tons of different vendors. After setting a budget and evaluating all my options, I’d eventually settled on something. And then a post on wranglerforum.com changed my mind. 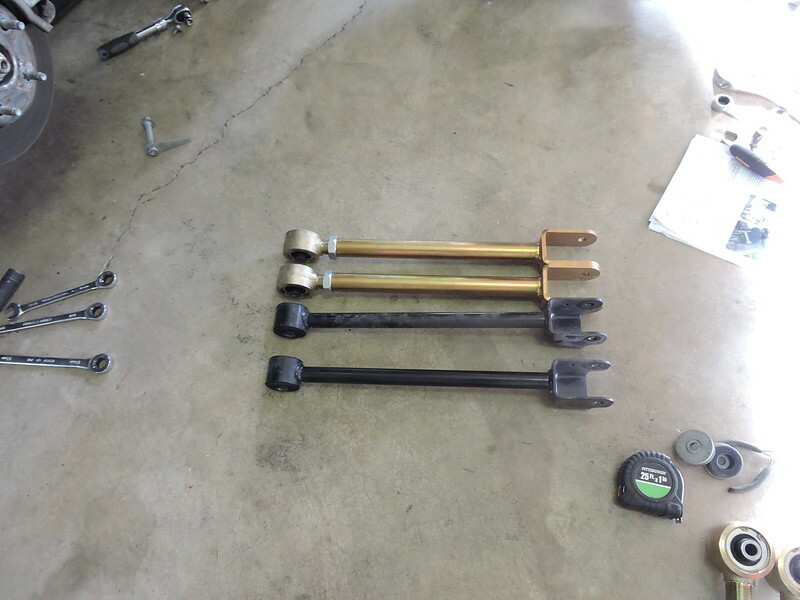 Every once in a while, MetalCloak has done this special package where if you pay with 1 ounce of gold, they’ll sell you a 2.5” – 3.5” lift kit at a pretty good discount and give you free shipping. So I went on the local hunt for gold, and eventually found a 1oz. gold bar, and shipped it off. A few days later, the lift was here in all its pieces and parts. It came in 6 separate boxes delivered by 3 different UPS trucks on the same day. 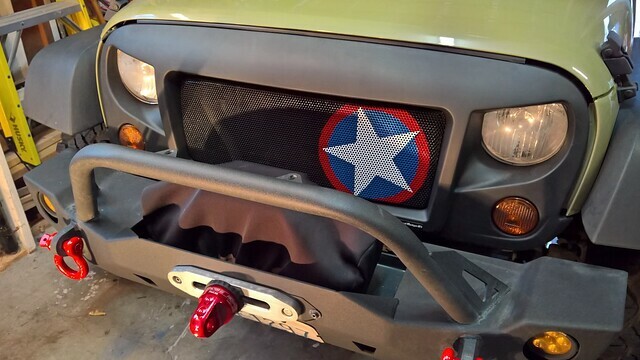 A few weeks later I finally had time to install it, with the help of “the Garys” from the Northwest Jeepcast podcast. I went over to Gary’s garage, which they call the “Mechan-hack shack”, where they had all the tools (and knowledge) to do the install. 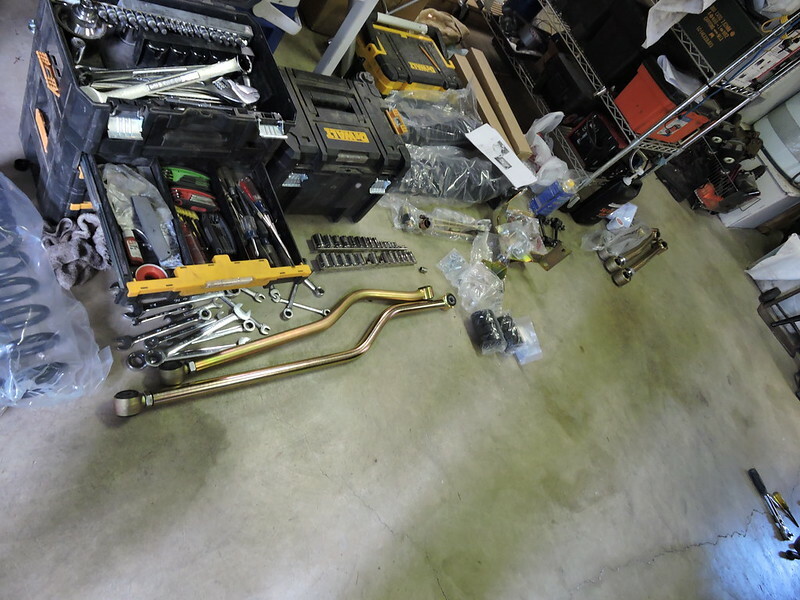 pieces, parts, and tools before the install. look how clean the floor is! by here, a bunch of things are out, and we’ve already replaced the brake lines on this side with the new (red) ones. time to start putting things back together. 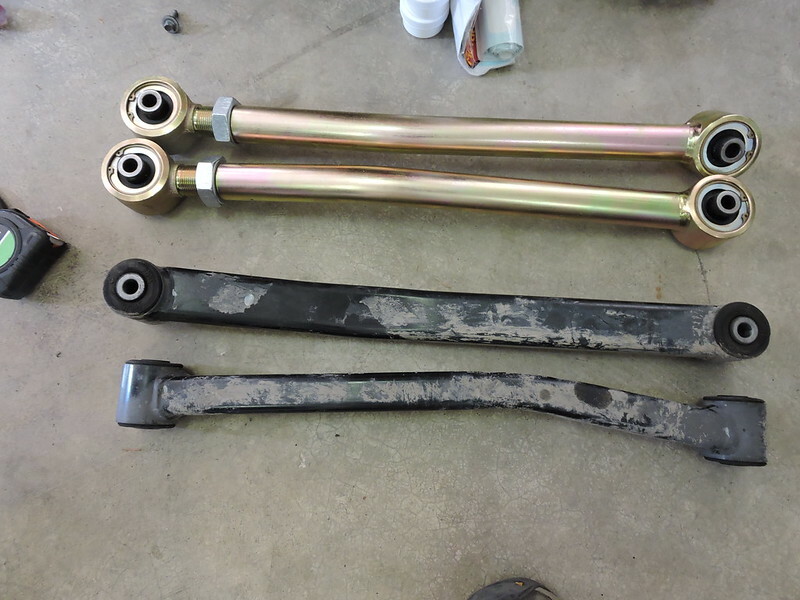 control arms comparison. the new ones are much cleaner, much shinier, much heavier and adjustable. 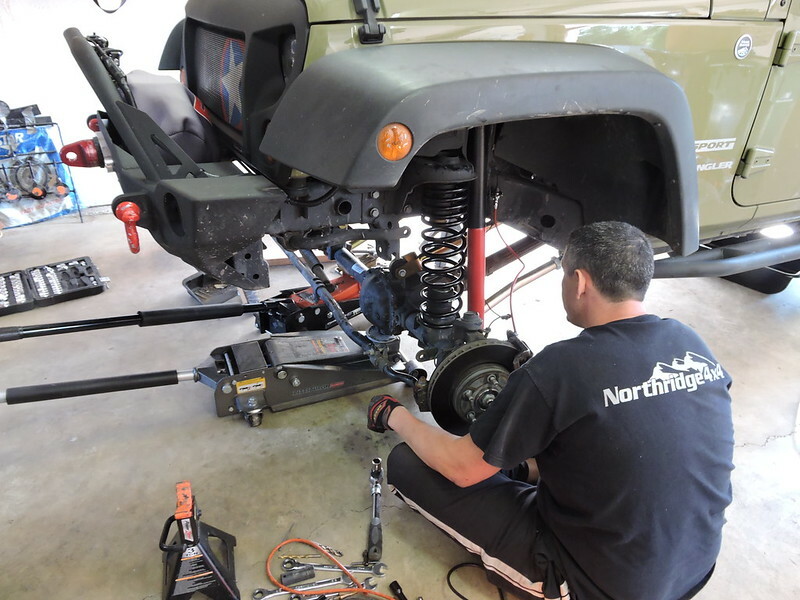 springs and bumpstops are in, and the shocks are going in. I swear every picture I got of Gary he looks like he is mediating. He might be, I’m pretty sure Jeep things are where he finds his Zen. this is one of the few pics I got of the rear. by this time, I think Gary is contemplating which order to do things. 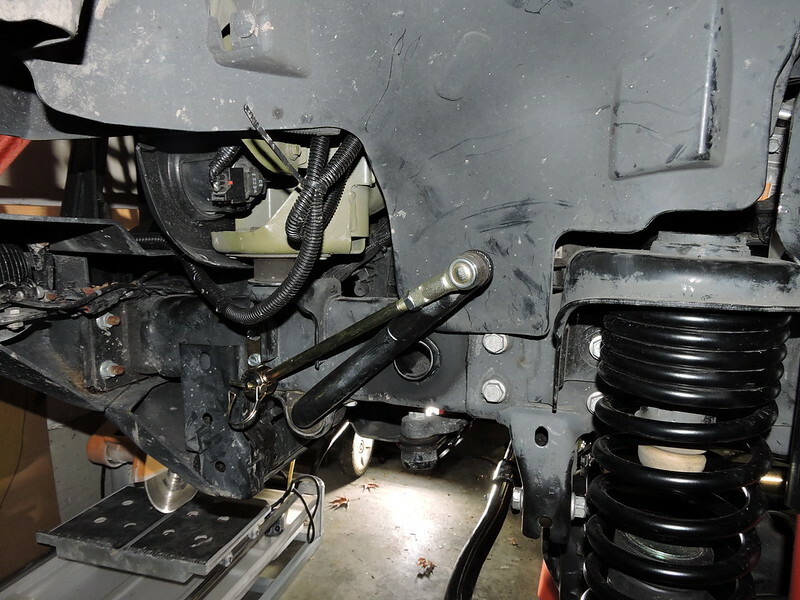 the instructions have one order, but I’m pretty sure it turns out that if you do the track bar last, there’s a lot more room to get the springs in? 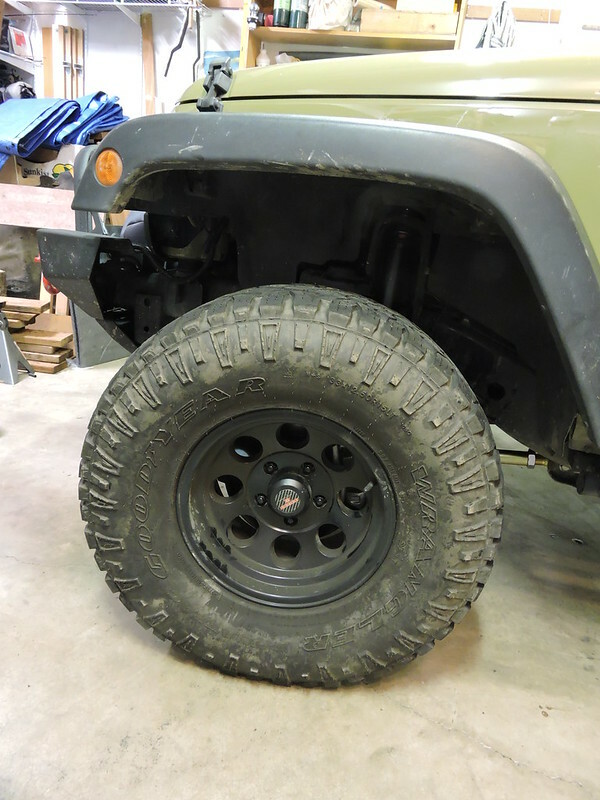 if you do things in the order MetalCloak has in the instructions, then I think there’s the bump stops and the track bar relocation bracket in the way on one side, and bump stops and the track bar in the way on the other side. 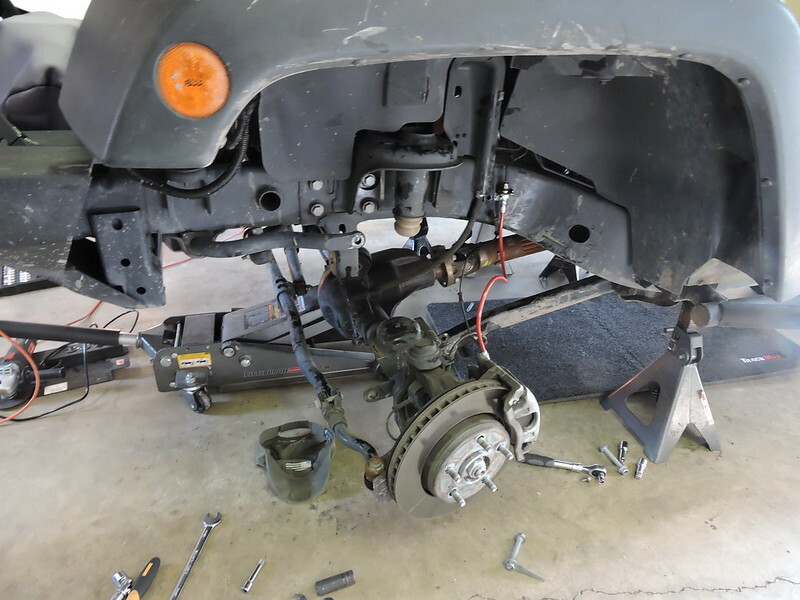 The one thing we didn’t get to when at the ‘shack was installing the brackets to hold the sway bar end links up out of the way when disconnected. 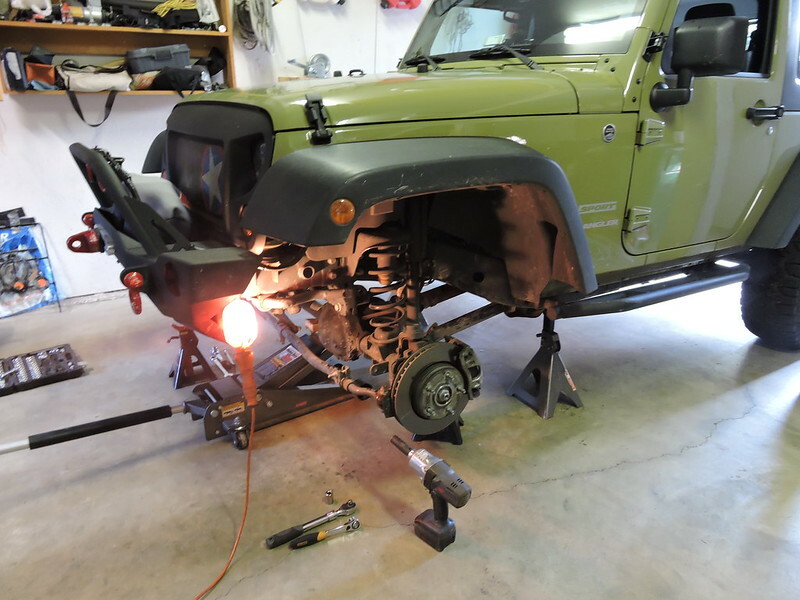 it was something I could do in my garage by myself, and you don’t need to do it until you actually need to disconnect them. So a couple weeks later when I had some free time on a Saturday I decided to do them. I’m pretty sure that tube sticking through the frame isn’t really supposed to be shiny! 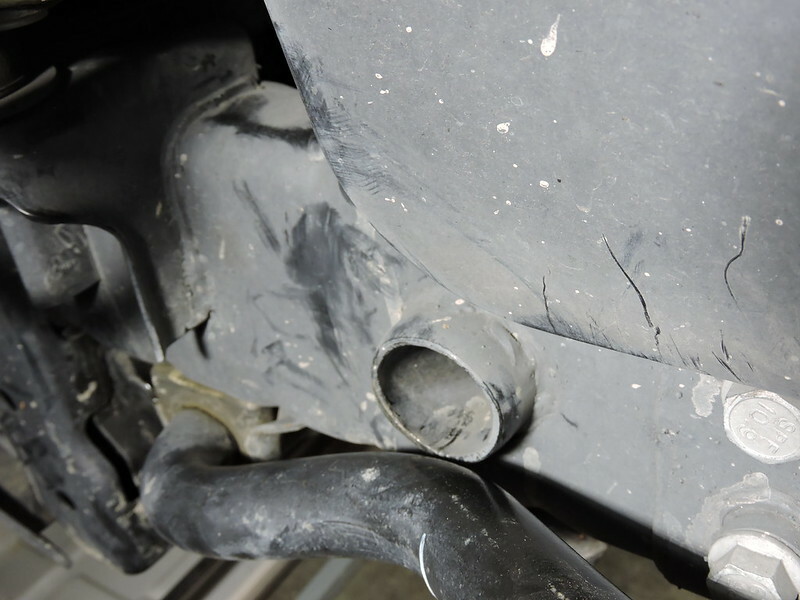 So over the last who knows when, apparently my sway bars have gotten up high enough to rub on that pipe, on both sides. 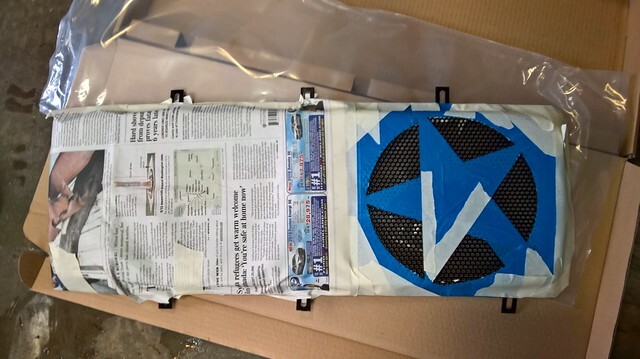 the bracket is intended to go forward of that, on the frame right on the other side of that mount. 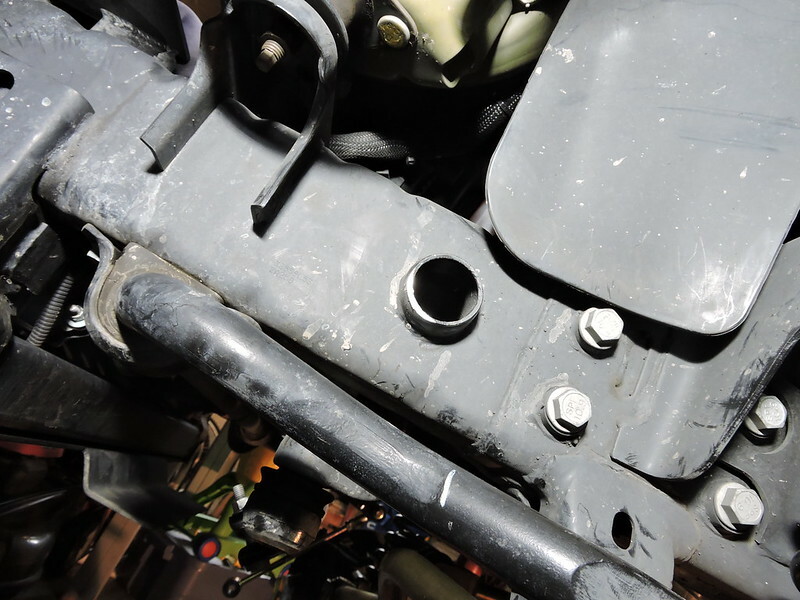 without being able to move the sway bar up any higher, there’s literally no place that the sway bar end links will reach where I could mount the bracket. so out came the dremel multimax and the little angle grinder I have. on the driver’s side I had to cut off like 1/8” of an inch of the pipe. on the passenger side, a lot less work, I really only had to grind it down a touch. 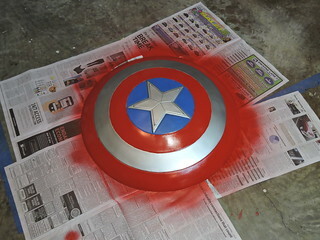 a touch of spray paint to cover it up, and then the actual work I intended to do could start. installing the brackets just requires drilling a couple holes and installing some self tapping bolts. all done! 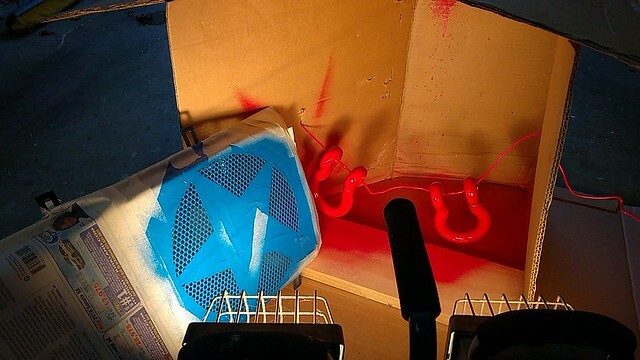 My garage spray paint booth and heat lamp. now can you spot the masking problem? derrrrrrrrp. i had to mask off the whole thing again just to paint a tiny blue part. i thought about spraying some blue paint into a paper bowl or something and brushing it on, but i figured that would end up being worse than just painting that part again. 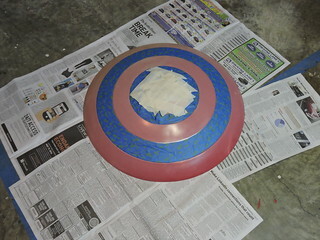 After re-doing part of the blue, and then doing the red, we have the final product, a start that looks (to most people!) 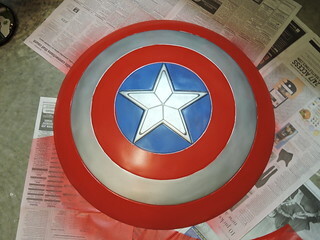 like a Captain America shield. 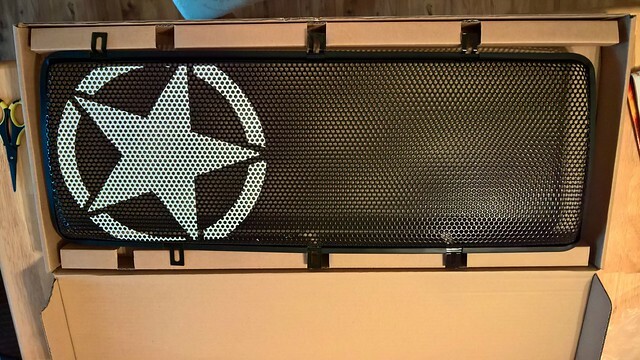 i thought about doing another white and red stripe, but it seemed like overkill. 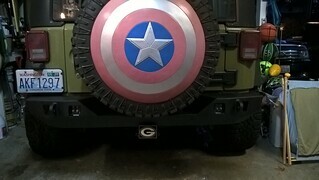 The finished product, on the jeep. 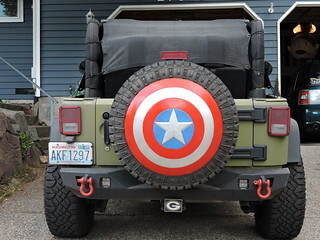 the only “bad” thing is that the winch and bar hide a lot of the shield if your looking straight on. But that’s ok, i wanted it to be somewhat subtle. 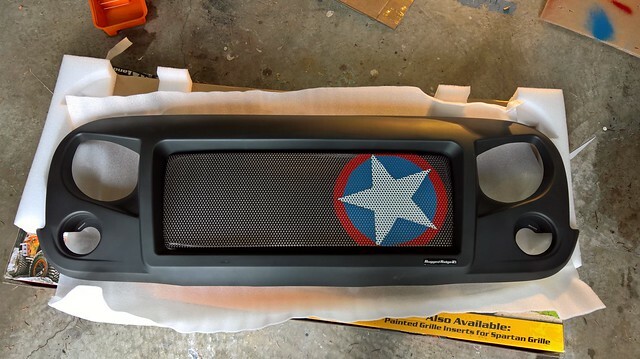 After how well the grill came out, a few months later i realized just how faded the shield on the spare was getting. the red is almost pink! 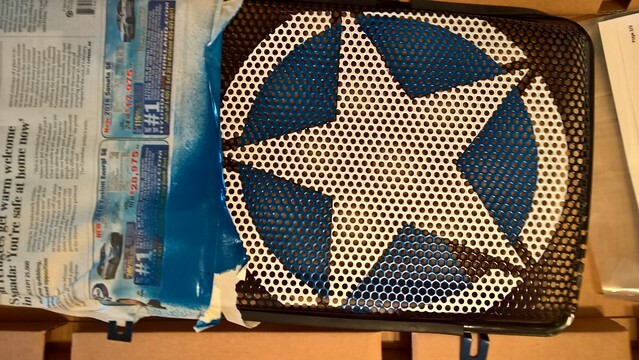 So, given how the spray paint worked on the grill, i decided to try to paint the shield as well. I’m looking for a better (metal) one, because the plastic costume one i have is both faded and cracked in a couple spots. Masking circles is a pain. 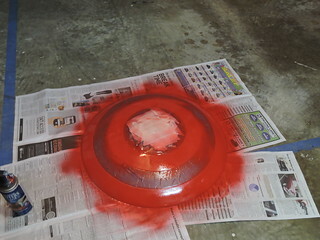 Masking a really big circle like the silver ring and the center star is a giant pain. Red goes on. It looks really red compared to the pink that was there. I’m not sure it was ever this red, even when i got it new..
all done, masking removed. now for a few coats of clear that will hopefully protect it some from the elements. i’m still not sure if this clear coat has any kind of uv protection or not. we’ll find out real fast. the finished product, all good to go. I was worried that the blue would look really faded after i did the red, but the blue looks pretty much fine. Every once in a while, you run into one of those problems while debugging where you just don’t get what’s going on. 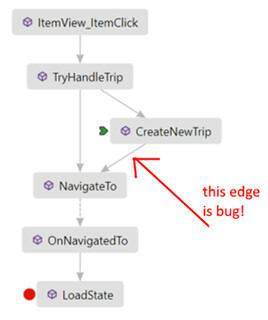 you’ve stepped through the debugger 10 times, and you see it happening, but you just don’t know why. Waaaaaaaaaaaaaaait a minute! there’s a triangle here! two different places are calling NavigateTo! how did i not see this before? i had presumed earlier that it was the same exact stack twice, like i somehow had added a listener twice or something, so the event was occurring twice, or something like that. i didn’t realize i had two paths through my own code that were doing this. one of those 2 arrows shouldn’t be there at all! the back button was working just fine: going back once went back to another copy of the page, so it just looked like nothing was happening when you pressed back. Within 5 seconds of the graph updating, i knew exactly what the problem was. i deleted the one extra call to NavigateTo, and the problem was solved. I’d been banging my head on this for like an hour up to this point, trying to figure out what the repro was, and then staring at the same stack window and code over and over and getting nowhere. Sometimes you just need to look at the problem a different way! DebuggerMap for the win! It was announced this morning that what used to be Windows Live Writer has been forked, modified, and open sourced under a MIT license as Open Live Writer. Prior to Facebook, i used to post a lot more stuff here on my blog, and when i did, i did most of that posting using WLW. Microsoft stopped actively developing it after the Windows Live Writer 2012 release and most of that team was moved to working on making apps for Windows 8. I still used WLW after that, but slowly over time the plug-ins i used stopped being supported, and it became a little bit harder to use. And Facebook made it easy to post little things, and life always has a way of finding other things to do. I always mean to post more stuff here, and i probably have 10 or more unfinished drafts either as WLW .wpost files, or saved as drafts in WordPress. So when there became a push inside Microsoft to see if Windows Live Writer could be open sourced, since Microsoft had no plans on reviving it, I volunteered to help. I don’t have a ton of free time (kids! ), but i still wanted to see what i could do to help. I didn’t do a lot, and most of what I did commit was deleting massive swaths of obsolete code (one of my favorite things to do! :)) It was really interesting to be on Skype video conference things with internet / Microsoft celebrities like Scott Hanselman and Jon Galloway and Martin Woodward. Fun fact: Scott Hanselman is king of meta. He’s 3d printing a 3d printer with a 3d printer, while using Open Live Writer to blog about Open Live Writer. It’s hilarious to hear the 3d printer’s “i’m finished!” song while he’s on a call, and then shows you what fantastic thing just finished printing. Open Live Writer is open source on github, and people are 3d printing 3d printers. Welcome to the future! It was hilariously awesome…for adults! 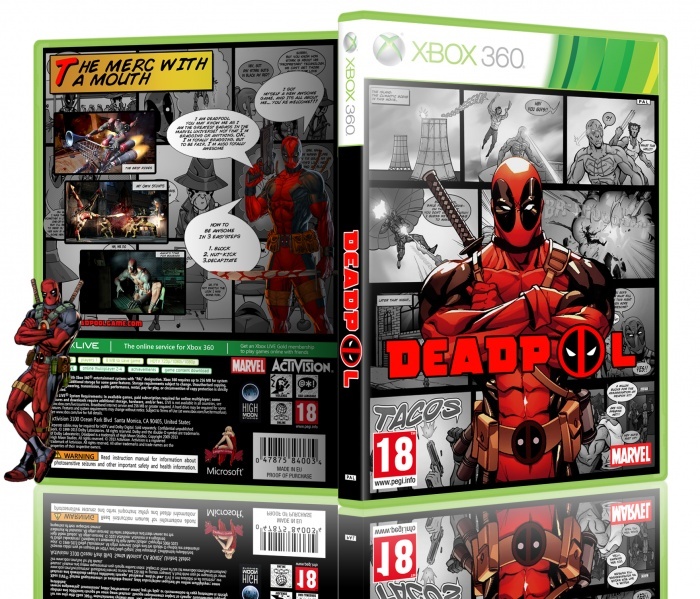 My kids love Deadpool in the Lego: Marvel Superheroes game; he has lots of funny animations, and quips like “I’m not dead. I don’t have a pool.”, and so my children will just say that, for no reason at all while playing. But there’s no way I would ever let them see me playing this game. It is brutally violent, has tons of swearing, and lots of sexual innuendos, hence the Mature 17+ rating. Playing this game made me super excited for the upcoming movie with Ryan Reynolds! Simply stated: Dragon Age: Inquisition is the best game I’ve played in a long, long time. It was so good, that now that I’ve finished, (twice! After I finished the first time, I loaded a save from several days prior and did several companion quests, finished up some loose ends, and finished the main storyline a different way), I am kindof on a Dragon Age hangover. I really just haven’t been in the mood to play anything. Since I’m not in the mood to play, I figure I better write about it! I loved the original, Dragon Age: Origins. It is one of the few games I’d played where I really cared about the decisions I’d made, and in one case, one of the decisions haunted me; I’d been used, and by the time I realized it, it was too late to undo. After completing the game, I’d started over, hoping to change that decision (and finish on nightmare mode or whatever), but I never finished the second time, there were other games to play. To this day, I still feel bad about it. The Keep is amazing. 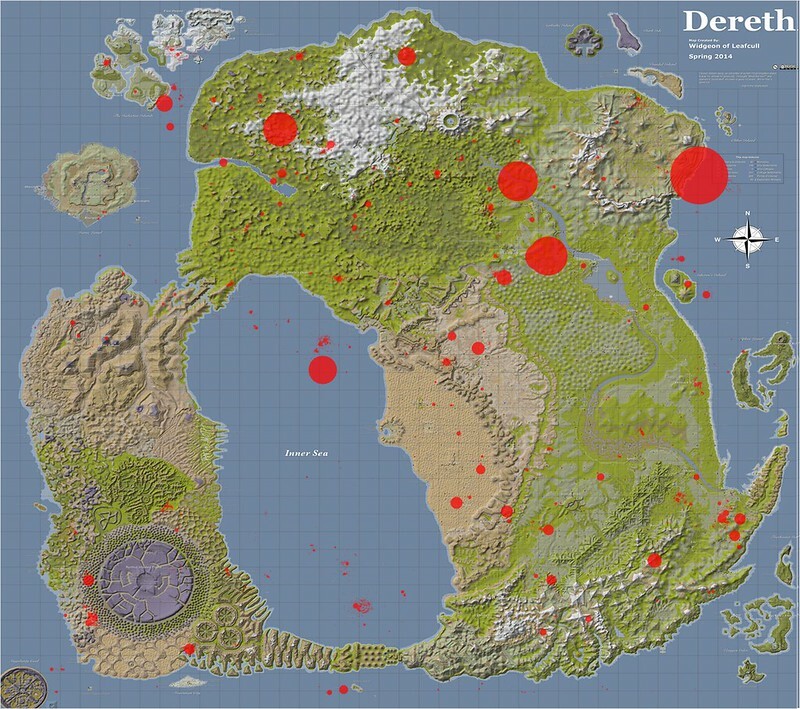 If you’ve played the previous 2 Dragon Age games, it can import your world state, bringing in every decision you made in every quest or plot point throughout the games. It knows which companions you met, if they liked you enough to do their story quests, if you’d romanced anyone, who died, who became king, every little detail. At Penny Arcade Expo I went to a session where the developers talked about the giant decision network that powered the whole thing, it tracked something like 200+ decision points, of which many had more than one possible outcome. That makes like 2200+ possible world states, but was much more complicated, because depending on some decisions, entire subsections of the graph was impossible. After PAX, I signed up for beta access, so I could finally fix that decision I’d made. And going through the keep was so cool. It shows you, in beautiful graphics all the decisions, what the choices are, what you’d chosen, and what other things in your world state might not be possible if you made that change. There were a lot of things that I didn’t remember doing, or things that I never even got to. There was even a companion I missed completely! And once I looked at the decision I’d made, that I hated all that time, I realized I couldn’t change it. I mean technically I could, I just couldn’t go through with it. While it seemed like a bad decision at the time, as the world has continued on, my decision might have had bad short term repercussions, over the long term, I think it was the better decision. If you hadn’t played the previous 2 games, the keep lets you make all those decisions as if you had, to customize the starting world the way you want it. You then use the keep to mark that world state as the one you want to start with in the game. All of that wall of text up there, and you aren’t even to the game yet! When you start a new game, you tell it to import your world state from the keep, and you start making decisions about your new character and this game! Without giving away any spoilers, there were several characters that were awesome. Many characters from the previous games return, some playable, some in “advisory” roles. When you talk to them, you can learn about what happened to them in the time between the previous games, and how your previous choices had affected their lives. This kind of engrossing story really makes the world feel like your world, and made me care about the decisions I was making. In DA:I, there was one main choice, do something yourself, without knowing the effects, or let someone else in the party, who has volunteered, do it. 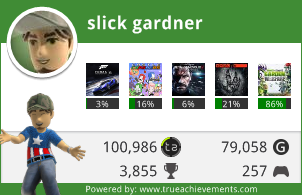 After finishing the main story line, I went back and looked at achievements I’d missed, and one of them is related to that decision. So I had to find a save from before that point, and work forward again, making the alternate decision, just to get an achievement. Odd. But in this (now alternate) version of my universe, I also took the time to finish several other companions’ story quests, because I hadn’t done them in the first play through. I really wish the character quests had been a little more obvious, there were some where you really had to pay attention to what someone said or did, or go to a specific place and buy something, etc. All in all I thought it was one of the best RPG’s I’ve played, certainly the best in a long time! Almost a decade ago, I posted my original review of my springfield 1911. 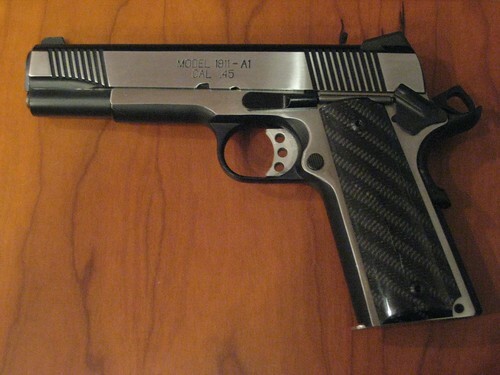 Over the years, little mods have taken place, like different grips, a different magwell, etc. The newest piece is a modification to the gun to enable an addition. I replaced the standard barrel with a threaded storm lake barrel, so that I could attach a suppressor! And yes, silencers are legal! The silencer here is a SilencerCo Osprey 45, which has a unique profile: it isn’t round like other silencers! The effectiveness of a suppressor is directly related to the internal volume of the suppressor, which captures the expanding gasses as they escape from the barrel. In order to maximize the volume, most silencers are cylindrical. And the bigger the cylinder, in both radius and length, the better it works. however, with a pistol silencer, you don’t want it to be too long, or it quickly becomes too heavy out there on the end of a pistol. And you can’t increase the radius of the cylinder too much, or you’ll interfere with the pistol’s sights! For rifles, neither of these are usually an issue, as overall length isn’t as big of a deal, and most rifles already have sights elevated over the height of the bore for other reasons. But on a pistol, the only real way to increase the volume is to make the suppressor a shape other than a cylinder. So the Osprey is an eccentric shape, basically a rectangle with rounded edges. 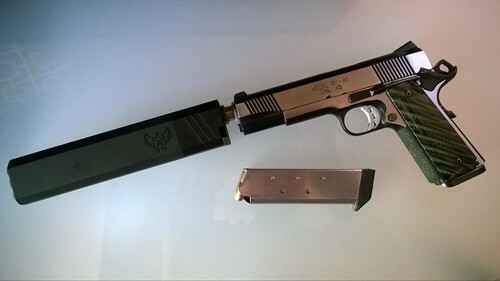 the flat top edge makes most pistol sights still visible, and because of the design of pistols and the location of recoil guides and springs below the barrel, the bottom edge generally doesn’t interfere with any lights or lasers that might be attached on a pistol’s bottom rail, if you have one. But if the suppressor isn’t a cylinder, a new problem arises: it isn’t symmetric, you can’t just thread it onto a barrel and have it line up! With cylindrical cans, you just rotate it until the suppressor stops, and it doesn’t matter which way the suppressor ends up. But with the osprey, that wouldn’t work. so there’s a locking cam mechanism. You rotate the osprey on normally until it stops, then unlock the lever, rotate the silencer until it is the right orientation, then lock the lever. from then on, whenever you take it off and put it back onto the same host, it will line up! At the range, the osprey definitely adds some weight to the front, but doesn’t make the pistol too front heavy, and the weight out front seems to help a little with muzzle rise. As with any suppressor, the blowback in your face might be a little surprising, so make sure to wear your safety glasses! And, again, like any suppressor, it does get hot fast, so remember to bring gloves! I need to buy an ove-glove or something to put in my range bag! 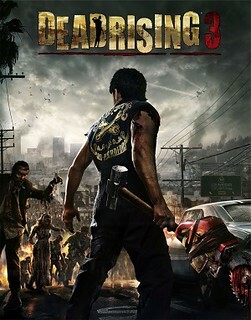 When the Xbox One released a few months ago, Dead Rising 3 was one of the launch titles. I didn’t buy an Xbox One right away, instead I waited for the holiday drama to subside, and watched for people selling consoles they might have bought only to flip to people that were desperate for one during the holidays. And indeed, I did get a great deal on a bundle with an extra controller, Dead Rising 3, and Lego Marvel. My review of the 3rd installment would be very similar to the first one. It was awesome. Hilariously awesome. Execution wise, very similar to the first game. You have a limited amount of time to follow through the story, rescue people, and wreak mayhem amongst the hordes of zombies. and on the xbox one, they are literal hordes. It was amazing to be standing on the roof of a car, and its just zombies, everywhere, as far as the eye can see. Thousands of them. Dead Rising 2 apparently introduced the “combo weapon” concept, where you can take 2 random things, like a rake and a car battery, and turn them into an electrified rake. Or a giant stuffed bear, a machine gun, and a radio (or whatever) to make this automated bear machine gun that sits on the ground and taunts zombies, then kills them. And many of the combo weapons can then be combined with something else to turn them into “super-combo” weapons that can do amazing amounts of damage or maybe small amounts in a very hilarious way. One of favorites was “the ultimate shout”, a combination of an orange traffic cone, a speaker, a battery, and a portable radio. To use it, you’d hold it up and yell through it, causing all zombies, vehicles, and items in like a 30 yard cone in front of you to be destroyed and sent flying. Another was the “Electro ice staff”, which was a traffic light combined with a battery and then liquid nitrogen. you could swing it like a staff, or ram it into the ground, freezing everything around you, or aim it like a gun and fire it to freeze zombies in front of you. As you can see in the video, my character looks a little.. out of the ordinary? Prior to this, there’s a section of the game where you have to infiltrate an area filled with special forces soldiers. You have several options for getting into the area, like attacking, guns blazing at the front door, sneaking in through a high window, or blending in by finding a uniform. Like the other dead rising games, there are clothing options scattered throughout so you can change clothes and look like whoever you want. prior to this point in the game, I was always wearing a “Mr. Rodgers” style red sweater, which I thought looked rather stylish :). It turns out, if you’re wearing the uniform, special forces soldiers won’t shoot at you until provoked… So I took advantage of this for the rest of the game. I picked up other clothing to try to get achievements, but I always went back to the SF outfit. And my crazy outrageous head is a Blanka (of street fighter fame!) mask. It turns out the mask can be combined with other things to make a mask weapon as well, but I wore it because it looks hilarious. Even more hilarious than running around killing zombies with a blanka mask on? Cutscenes with a blanka mask on! None of the other people in the game seemed to notice that I was wearing a hilariously outlandish mask. I swear there was a kissing scene that I recorded, but I can’t seem to find it on the game dvr. If I find it, I’ll add it here. All in all, dead rising 3 was a great game. The story was good, the forced timeline forces you to make some decisions about who you’re going to try to save, and how much extra stuff you’ll try to accomplish. The characters are believable to a point, and then they throw all believability aside because, well, it’s a video game about zombies that started with mutant cows to produce cheap hamburgers. While violent, a lot of the violence is hilariously cartoony, like driving a steamroller combined with a motorcycle that shoots flames. So fun! At one point, Dead Rising 2 was free in the Games for Gold program, so I did download it (I think! ), now I’ll just have to find time to go back and play it, so I can fill in the parts of this story that didn’t make sense!